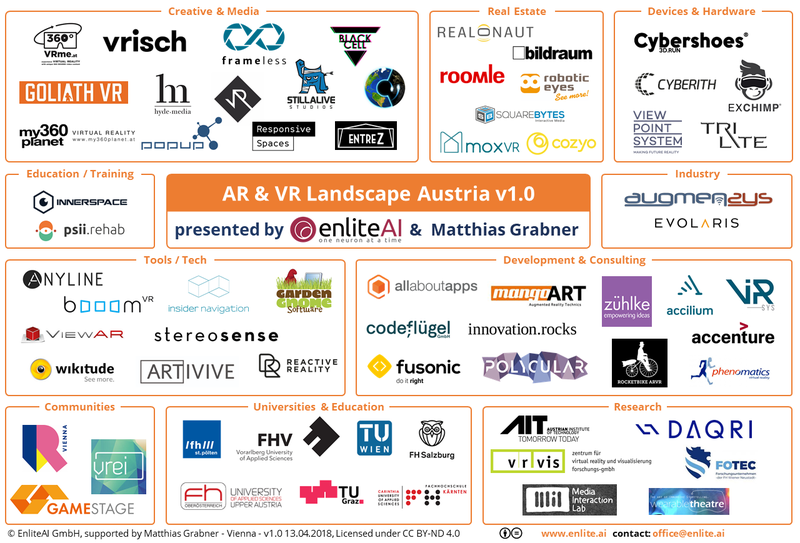 The Austrian AI Landscape was initially created in October 2017 by enliteAI as a side project. This updated version v2.0 includes 90 new companies and organizations with a total of 163! Newly added companies & institutions are marked with “v2.0” for easier identification in the text below the infographic. Unfortunately, a small number of previous entries shutdown business and are no longer listed in this version. As a startup focused on Artificial Intelligence, we follow the Austrian AI community closely. startups, corporates and research institutions have been creating world-class solutions powered by AI. corporates and accelerators as well as research- and educational institutions. You're welcome to re-use the infographic below as long as the content remains unmodified, in full and proper reference to the source is mentioned. On a positive note - universities and educational institutions who offer AI-related courses (Deep Learning, Data Science, ...) were the fastest growing category in 2018! gathered from their fields, while Smartbow provides automated monitoring, localization and heat detection for cattle. Technologies like these can support farmers to increase margins and limit operational risk. years, local companies not only accelerated their efforts towards e-mobility and digitalization, but also lead the charge when it comes to applying AI in automotive engineering. With Evolve.Tech a classic DeepTech startup has emerged, which aims to revolutionize voice detection with custom models and AI silicon. Austria is home to several regional headquarters of international AI Tech Companies. These companies are very active in both promoting AI and its capabilities to corporates, as well as supporting the ecosystem with free trainings and events. Financial institutions have been widely disrupted by new technologies, and AI is one of them. The reasons why financial firms are implementing AI into their processes is to increase security, reduce processing times and increase levels of automation, among others. Investment activity has been especially strong in this sector, which is a testament to the quality and business acumen of these companies. Austria’s medical universities provide a perfect combination of large datasets, cutting edge technologies and a high willingness to create spin-outs. Research focus in this area lies mostly in the detection of skin and retina diseases. cover sensor-fusion and image recognition for robotics, as well as deploying AI assistants in the field. With toolsense a new interesting player has emerged, which aims to bring AI capabilites to the construction industry. While small in number, InsurTecs like Dolphin and Twingz have reached a high level of maturity in product and team. With cortical.io and the Semantic Web Company two pioneers in text and speech analysis for large B2B clients are based in Austria. Recently a new wave of companies has emerged, which also cater to B2C customers..
Social media monitoring or auto-summarization of documents and text is carried out by companies specialized in media analytics. form of a calendar, a scheduler, or even a personal butler. What all of them have in common is re-allocating hours of wasted productivity, which lets you focus on more important tasks. in its first year of operations. powerful digital content? Intellyo might be your platform of choice, while Logoshuffle will help you creating your company’s CI in no time. Canada. Most majors were introduced recently and mainly focus on data science. Interestingly it’s not the technical universities that lead the change but a mix of universities for applied sciences and medical universities. short-term memory, which forms the basis for automated translation systems we use every day. Furthermore, with the OFAI Vienna, Austria has one of the longest-serving AI research institutions worldwide. Austria has a vibrant AI community, which organizes events and meetups on a regular basis across the country. Recently, with AI Austria a non-profit think-tank has emerged, which aims to promote development and application of AI in Austria. In 2018 several local players have emerged who want to promote AI and its potential to local businesses of all sizes. On a federal level work on a national AI strategy has started and is expected to be completed around the mid of 2019. In the meantime, special zones for testing autonomous vehicles have been already designated, with a similar regulation expected for autonomous drone soon. funds, as a result a gap was created which was quickly filled by corporates starting their own programs and the local start-up community, that created the equivalent of a Y Combinator for AI and Art. Austria does not have publications specialized on AI or technology trends, however the startup media has picked up the topic and is doing a great job of reporting about the progress in this area, both locally and internationally.